VICIOUS CIRCLES are not new in Dry Eye Disease and Members of the Ocular Surface Center Berlin (OSCB) have frequently suggested Vicious Circles in Concepts for Dry Eye Disease in various publications. VICIOUS CIRCLES are actions of pathogenetic negative factors that eventually act BACK onto themselves. VICIOUS CIRCLES are not new in Dry Eye Disease and Members of the Ocular Surface Center Berlin (OSCB) have frequently suggested Vicious Circles in Concepts for Dry Eye Disease in various publications. (please see the little collection above, dating back to the year 2000). Pathogenetic amplification loops termed Vicious Circles often have interposed further factors before they act back. Vicious circles are thus not always immediately detectable. => By vicious circles a pathological process is amplified and progresses, gets worse and tends to perpetuate if it is not interrupted by suitable and timely therapeutic intervention. It is an aim of this homepage to spread the knowledge of ocular surface disease and its important disease mechanisms in order to promote a timely diagnosis and therapy. When people had adopted the idea of Vicious Circles in Dry Eye Disease, as e.g. in the DEWS Workshop Report 2007, the concept was put in an over-simplified and thus misleading way as one large single Vicious Circle. However, the idea of a single vicious circle is misleading - it is half true and half wrong ... such ideas usually cause most problems. it is right that Dry Eye Disease indeed has amplification mechanisms that perpetuate the disease process. but it is wrong and misleading that there is one single vicious circle - because this implies the misleading suggestion that therapy can interfere anywhere in this proposed circle ... and will still always successfully interrupt the disease process in Dry Eye. The latter is obviously wrong ... as the experience in patients with Dry Eye Disease has shown over the years ! Members of the Ocular Surface Center Berlin (OSCB) have identified several different and interacting Vicious Circles in Dry Eye Disease - not just one as frequently assumed. Vicious Circles do not necessarily depend on inflammation, even though inflammation, as a mighty cell biological process, gives rise to many of them. Members of the Ocular Surface Center Berlin (OSCB) could identify several different interacting vicious circles in tissue and tears during Dry Eye Disease. Vicious Circles "drive" the disease process - they are ´Patho-Physiology in a move´ and represent the dynamics that the practical clinical course of Dry Eye Disease in fact has. In order to make these DYNAMICS IN DISEASE understandable - DYNAMIC VISUALIZATION tools such as the ANIMATIONS used here on the Internet pages of the Ocular Surface Center Berlin (OSCB) are superior in many aspects to ordinary static representations and diagrams. It is important to be aware of the different Vicious Circles and their interactions in order to understand Dry Eye Disease and its progression sufficiently. Understanding of the vicious circles that are active in an individual patient is important for an effective therapy - which is a notorious cardinal problem in Dry Eye Disease as we know ! A vicious circle that does not primarily depend on inflammation closely links an interrelates Tear Film Deficiency and Ocular Surface Damage. The Surface Tissue Damage that occurs in Dry Eye Disease and proceeds via a sequence of secondary pathogenic factors - with chronic mucosal inflammation as a major amplifying factor - also involves the tissue of the ocular GLANDS. The ocular GLANDS are an integral part of the ocular surface (for details please see the chapter ´Anatomical Unit´) , like the main and accessory lacrimal glands and the Goblet cells of the conjunctiva. The Meibomian glands are only separated from the conjunctival sac by the conjunctival tissue itself - for details, please see the section ´Ocular Surface´. There are at least two clearly inflammation dependent vicious circles that occur during the pathology of Surface TISSUE DAMAGE. Both of these Vicious Circles originate from the abnormal cell differentiation in the tissue with angiogenesis and driven by the chronic inflammation that gives rise to the corrupted tissue differentiation. Squamous metaplasia with loss of goblet cells and mucins is also, at least in part, promoted by inflammatory mediators. Inflammatory events play a role in the Dysfunction of both main Ocular Glands - the Lacrimal Gland and the Meibomian Glands. Lacrimal Gland Dysfunction (LGD) is the most prominent cause for Dry Eye Disease but, as now widely known, it is not the most frequent cause. Sjögren´s Syndrome, the main reason for primary LGD, is an auto-immune inflammation of this mucosa-associated gland. The more frequent sensory nerve impairment occurs as a secondary phenomenon mainly due to inflammatory events at the ocular surface. Meibomian Gland Dysfunction (MGD) is also promoted by inflammatory events of different kind that integrate MGD into the Vicious Circles of the ´Pathological Carousels´ of Gland Destruction - please see below. 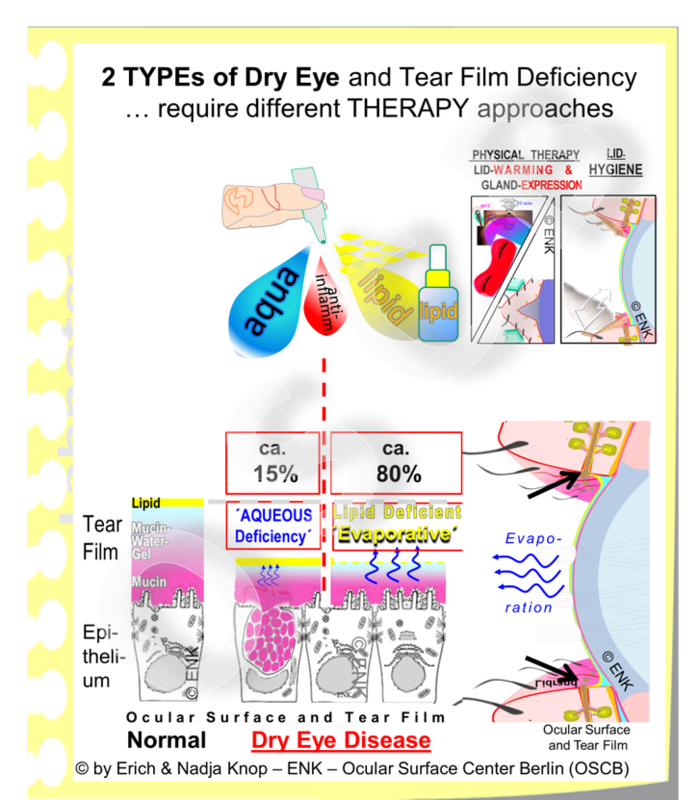 A major concept for aqueous tear deficiency in Dry Eye Disease is an afferent sensory nerve fiber impairment due to chronic inflammatory processes at the bulbar surface (cornea and conjunctiva) in dry eye disease. Dysfunction of the afferent sensory nerves will lead to a dysfunction of the neural reflex arc for driving the efferent innervation for secretion of the lacrimal gland. or secondary due to any other condition that may lead to onset of an inflammatory chronic Dry Eye Disease. This can occur secondary to MGD, to systemic disease, to impairment of regulatory systems and to environmental risk factors - as explained in the ´Overview on Dry Eye Disease´. In Meibomian Gland Dysfunction (MGD) at least parts of the pathology also depend on inflammatory events. which is supported by the observation in the available histological investigations that lymphoid cells do typically not occur. Some evidence from confocal investigations, which however have a very limited resolution in this respect, seem to indicate that inflammatory cells may sometimes be involved in the pathology. by chronic mechanical irritation in contact lens wear because long-term contact lens wear leads to a distinct reduction of the gland tissue by disappearance (drop-out). by chronic inflammatory Ocular Allergy which is largely affecting the tarsal conjunctiva where the Meibomian glands are located. This has a similar negative effect on the glands. Pathological Carousels of Gland Dysregulation link the pathology in the glands and at the "surface" of cornea and conjunctiva in a mighty Vicious Circle. the progression and worsening of disease in the glands would certainly negatively influence the function of the ocular surface which mainly serves, as described above, for the maintenance of moisture - and thus a LACK of Secretion was identified as one of the two basic causative factors for Dry Eye Disease. it must therefore be concluded that the described interaction between the "surface´, of conjunctiva and cornea, and the associated glands acts BACK in a Vicious Circle that reinforces the disease process in both of them. The Vicious Circles of Gland Destruction are termed as a PATHOLOGICAL CAROUSELS of Gland Destruction by members of the Ocular Surface Center Berlin. This appears to represent an important new factor in Dry Eye Disease. Pathology of the Surface TISSUE that feeds into Pathological CAROUSELS of GLAND DYSFUNCTION can further promote Pathology of the Eye LID. for more detailed information please see the section on the ´Lid Wiper´. Members of the Ocular Surface Center Berlin (OSCB) could show by histological examination that frequent pathological cells occur at the epithelial surface in Lid Wiper Epitheliopathy (LEW) and in such zones were less Goblet cells than typical for the Lid Wiper and necessary there as a buit-in lubrication system.